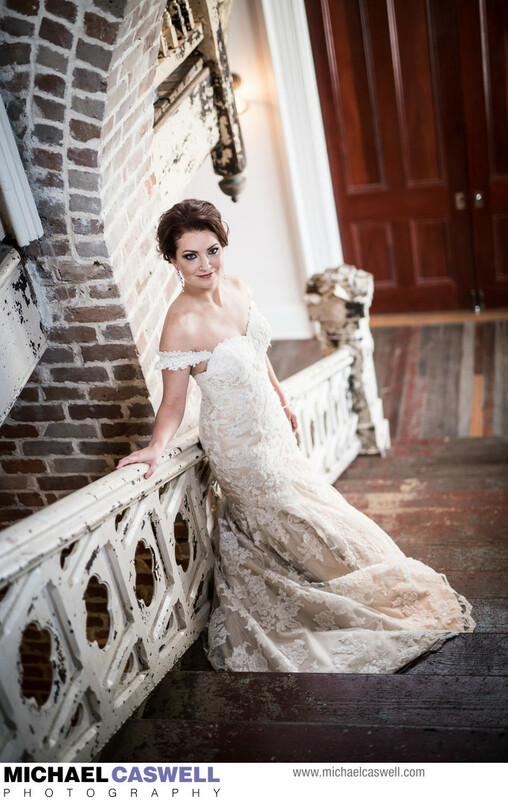 Felicity Church is a fabulous and unique wedding venue in the Lower Garden District neighborhood of New Orleans, which can accommodate ceremonies and receptions, but it's also a perfect location for a bridal portrait session. I wouldn't hesitate to go so far as to deem it a "photographer's playground" because of the amazing patina, numerous great spots to shoot, ample space to work with, and fantastic natural light that streams in through the large windows. It's also ideal for the brides themselves, since it largely eliminates worries over whether or not the weather will cooperate with their bridal portrait session plans, and provides privacy, cleanliness, and a comfortable environment for the shoot, whether it be the middle of August as with the case of this bride, or one of the rare frigid days we have in the Winter. There's also a changing room for the bride to get in and out of her wedding dress. I had photographed weddings at Felicity Church before, and had anxiously awaited the opportunity to shoot a bridal portrait here. Felicity Church was built in 1888, and the Gothic Revival structure served as a Methodist church for many years, but was heavily damaged in 2005 as a result of Hurricane Katrina, The neglected building sat abandoned until the present owners purchased it in 2011 and began a long and painstaking process of revitalizing it into a unique event venue for New Orleans. 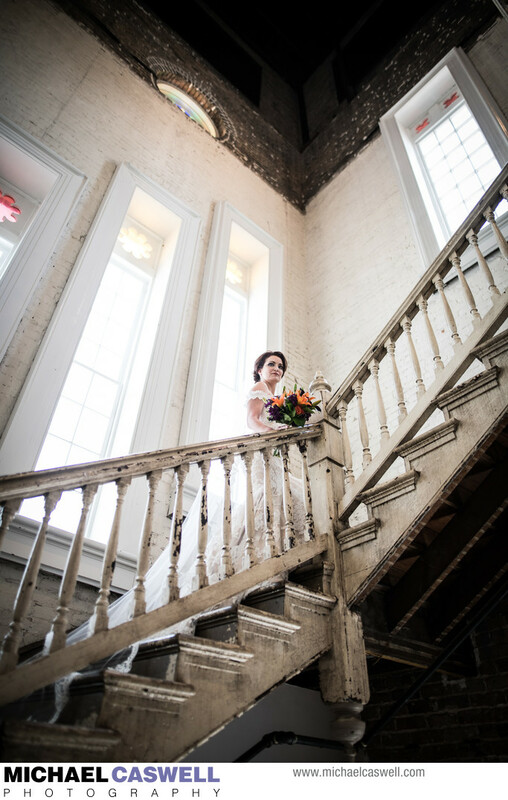 My favorite aspect of this venue is the readily apparent amount of effort that was put into retaining the stunningly beautiful aged look of the interior, right down to the chipped paint on the stair handrails. While perhaps the easy and obvious thing to do would have been to simply sand down all the wooden surfaces and apply a fresh coat of white paint, making the entire space "perfect" again, this would have taken away the amazing and unique visual character. But you also can't have loose paint flaking off all over the place, so instead they applied a protective coating to these surfaces to preserve them as-is. It is this aged look that gives wedding and portrait photographs such a stunning look – the visual contrast between a beautiful bride in an immaculate white dress against a weathered background. This bride's wedding was to take place in late September. 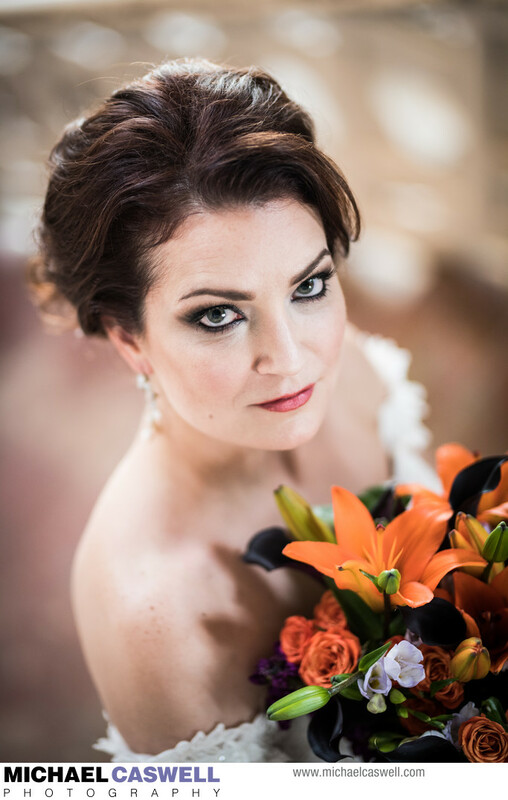 Weddings scheduled during the late Summer months and early Fall can present a problem in terms of the bridal portrait. 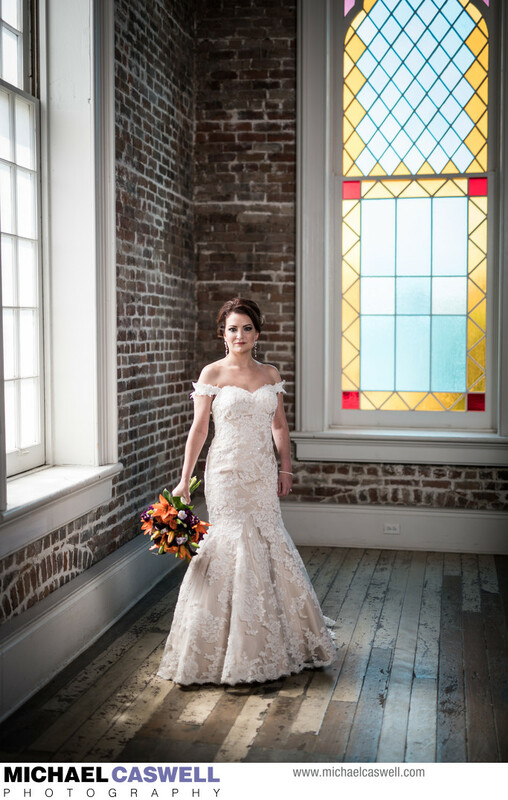 Because these sessions are typically are done about a month or two before the wedding depending on when the dress is ready, that put this session right in the middle of the hottest part of the year. 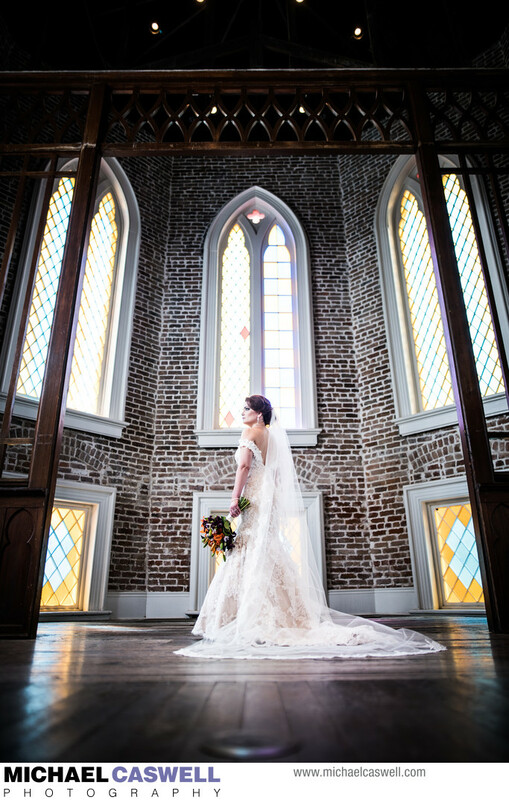 Most bridal portrait locations are outdoors, but Felicity Church provides a perfect place that not only looks incredible as a background for this type of shoot, but also removes the concerns of heat, or otherwise uncooperative weather. 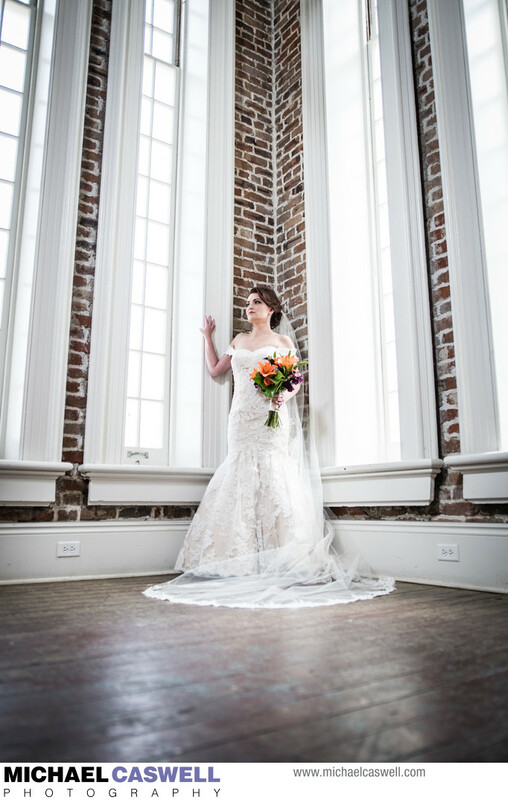 But I also wouldn't hesitate to recommend it for a portrait session taking place even in the typically mild and pleasant Fall and Spring months, if the bride expresses a preference for an indoor location. Location: 1220 Felicity St, New Orleans, LA 70130.